It is me, Maggie, again. How are you? I am back in Brooklyn after another trip to Jamaica, my Caribbean Jamaica, not the Jamaica in New York. The airline carrier that I travelled on was American Airlines, which of course warranted connecting flights in Miami. Getting to Jamaica was such a hassle. The fact that I was not wearing my red lipstick when I landed in Jamaica must have been a telltale sign to one of my keen-eyed nieces. She, including other people, often assumes that something must be awfully wrong with me whenever my lips are not polished fire red, as they would say. I guess the truth of the matter is that they enjoy calling me red-lips. That being the case let’s get back to the airline carrier. The fare was extremely expensive. Overall, I believe every jack man should query the rising costs of airfares because soon or later most of us will have to mortgage our properties or pawn items that are dear to our hearts to meet the costs. It’s either that or we should make up our minds to do our getaways by boats. Mary, this is no joke! The situation is very alarming! Should we hold oil as the culprit in all of this? Or, is it greed among the airlines? Speaking about greed, the airlines have become blatantly stingy in feeding their passengers. Mary, I am not ashamed to tell you that it was only a beverage of choice that was served on my round trip. Obviously, the party is over. Done! Finito! Gone are the days of hot meals, chips, biscuits, cookies and nuts. To travel on an airline with an empty stomach is no good. We fly at our own risk. Mary, I will depress neither you nor me any further with the inevitable. Instead let’s see if we can find enough joy to sustain sanity. I can certainly tell you that the trip to Jamaica gave me that and much more. Girl, I had a bonononus (great) time. As you know, August 6, 2012 marked Jamaica’s 50th year since it gained independence from England. The celebratory mood was detected from the moment the plane touched down at the Norman Manley International Airport in Kingston. Columns, walls and ceilings were draped with the colors of the country’s flag: green, black and gold. Mary, I wish you were there to witness the roadways, vehicles, and people along the route as I made my way to rural Jamaica, my paradise. The colors black, green and gold were brandished in every shape, form and fashion. As it were, the 50th independence birthday wasn’t the only celebration. There was the yearly Emancipation celebration on August 1, to honor the day all slaves were freed; coupled with that was the hype surrounding Jamaica’s track and field team at the 30th Olympics in England. Mary, it was the clash of three celebrations: 1, 2, and 3 as in the famed results of the men’s 200 meter. The people of Jamaica in every nook and cranny exploded with excitement when tiny Jamaica entered the finish line with Bolt, Blake and Weir finishing first, second, and third in that order. A grand historic feat and birthday gift for Jamaica’s 50th. Mary, I had planned to make this a brief letter but I find it impossible to comply. Hence, please bear with me as I continue. Frankly, on a personal level, the excitement in Jamaica got a hold of me to the point where for the first time in my life I attended night service at an Apostolic Church. The lively music, I noticed was a recipe for vociferous behavior. It had the members of the congregation up and about the pews stomping, dancing, running, crying and jumping. It turned out that they were all of the “spirit”. As for me, I had entered the House with the residue of a certain spirit which had me in a mellow mood. Mary, do not allow your thoughts to go in a negative direction. I did nothing wrong. People are allowed to go to that type of House just as they are especially if they require spiritual fixing and food. Furthermore, somewhere in the Good Book it is mentioned that the Lord takes care of fools and babies. Go figure that one for yourself. In my opinion the spirit which led to my mellow mood was a blessing in disguise as the Pastor ended his sermon. It enabled me to focus on a well groomed lady who stepped out from one of the pews and slowly made her way to the podium where she stood weeping and moaning in a sanctified manner. Others quickly followed her and one by one the leaders of the church toiled over them until they were silent with the exception of the well groomed lady. She must have been there to create excitement just like a pint-sized youngster who was dressed in a New York Giants cap and jacket and kept dropping his phone on the floor. A little later, at home, I found out that the lady was trying to tarry. As I understand it from the church’s perspective tarry means to stay at church all night praying, singing, and weeping all in the name of the Lord. Mary, my next statement may sound out of place but there is truth to it. The Lord is such a busy and called-upon man. He is involved in everything. I call to mind the following hymn: “All things bright and beautiful, All creature great and small, All things wise and wonderful, The Lord God made them all. Each little flower that opens…..” Well, girlfriend, as faith had it, I witnessed two creatures making love on a relative’s verandah in Mandeville, Manchester. I knew that something funky was about to happen based on the tenacious behavior of a big lizard that was chasing one smaller in size. I rushed for my camera and waited to capture the most talked about position in love making, the lizard lap. 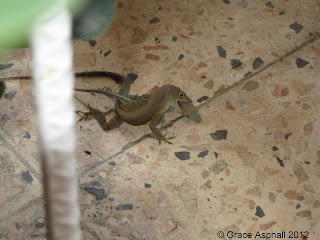 After about a minute, the lizards cuddled on the floor under one of the verandah chairs. I tipped toed closer, held my breath and in the best way that I could I pointed the camera and clicked several times, hoping that a good shot would be among the lot. I was amazed at the length of time they stayed on the floor marinating…hehehe. Maybe they were trying to tarry like the lady at the church. Wow! Finally after what seemed to have been a long wait they pulled apart and ran their separate ways back to the wilds of nature I suppose. In view of this, Mary, I will confess that it took a Jamaican vacation to make me realize that Mother Nature is really a funny creature. Sometimes in her quest to teach humans the rules of life she will resort to the bare facts without any qualms. 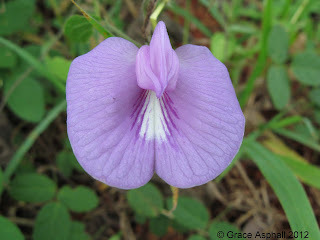 To defend that, I had also taken a picture of a flower which resembles a certain part of the female anatomy. I also call to mind, while in Jamaica, the few days when rain threatened to spoil some outdoor fun with family and friends. On one such occasion, the day that I celebrated Emancipation at Maidstone, Manchester, my childhood village, I looked up at the ominous clouds and begged for the rain to go away but some of the farmers had other thoughts. They chanted “fall rain fall” because the dry weather had their crops at stake. In time they had their wish and more as a few days later hurricane Ernesto was heading towards Jamaica and in the process dumped lots of rain and wind. Well, Mary I will not tarry any further. This is where I wrap up until next time. Enjoy the pictures. Tah-tah! Explore, observe and conqueror when necessary.